I have been playing it a lot lately and it is extremely addictive. Do recommend! Great game I am massive fan of the game but it is serverly let down by its customer support as when I contacted them about my account being hacked they told me that it hadn’t even though I know for a fact it had and they refused to help me. It is a great game and I love it but the war preparation day I don’t think should be 24 hours. Instead I think it should be 12 hours. As 24 hours is a long time. 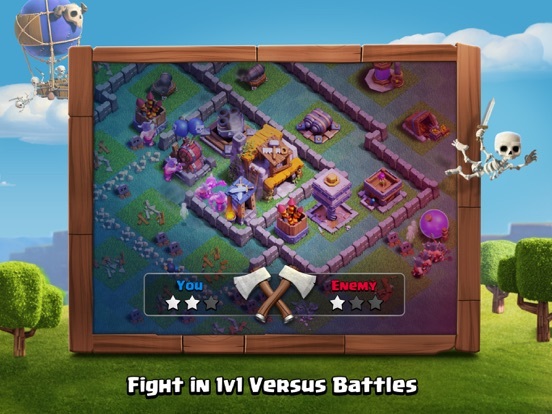 This game is a fun strategy game it is very cool and also family friendly lots of people play this game meaning more attackers however this game is very good and makes your brain choose wiser choices of how to attack a base which could help you in the real life a 5 star game 🤩🤩🤩🤩🤩 They always update which is good too. PLAY NOW!!!!! Great game but the barbarian king changed its look in the update and it doesn’t look as good now (cosmetic)as it doesn’t suit the graphics in the game. This game is BRILLIANT. But there are problems. Like this game can get very tedious when your low on money/elixer since you can’t do anything. Also everything is way overpriced. And it is annoying when you want to chat to your friends but when chatting someone else in the clan starts watching the chat when you don’t really want them to know what your talking about. To stop that please can you try to make a private chat for friends. Also the game would be better if you didn’t add the builder base, this is because when you added it people can’t really focus on getting your main base a good as possible.Now I said the bad stuff let’s get to the good things. Firstly this game is a brilliant idea, and when high on money/elixer can be amazing. Every object in the game is cool, and the troops are brilliant, especially the PEKKA. Overall this game is definitely a 4 star! Great game, maybe change grass colour? Any chance to have an option to change the grass colour in home village? Or just make it darker or less saturated? A shade of green/blue/grey, or something in-between home and builder village would look much better. I’ve been playing 4 2yrs now and I am a very rushed th9 I just got my archer queen but I mean WTF CAN’T GET GLADIATOR SKIN WITHOUT GOLD PASS WICH IS 4.99!!! I have been playing this game for at least a year now and its amazing. plus the new update which features awesome awards for free as well as a star bonus is awesome cuz it lets u have extra dark elixir and if it weren't for that update i will still be stuck on town hall 8!!!!! I love this game so much also please subscribe to my youtube channel called (true pro gamer Andrew)!!! also follow my instagram called (powersystemth8) CLASH ON MY FELLO FANS!!!!!!!!!!! I got banned for requesting to have my old village back. I obviously got in contact about getting my old village back in which I had the correct details for. I was just wondering if I can get unbanned as I want to play. I think this game is amazing. I have played it every day since I bought it. I would like to be able to have better costs for upgrades and more levels for the town hall. Super good game , totally enjoy . Would recommend to any teenagers . Very nice quality . Ye . Btw my name is vegan power . I just had this idea that wouldn’t make the jump spell/hogs ( basically anything that can/helps to jump over walls ) really good for jumping walls so that walls are basically useless. The same way you are able to gear up the cannon and the archer tower. 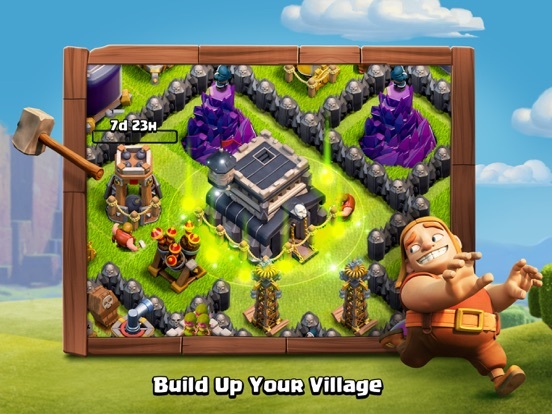 When a row of builder base walls get upgraded to lvl 4/5+ and the home village walls are lvl 7/8+ that you should be able to upgrade 10-20 walls in home village to a ‘Tall Wall’. Basically jump spells/hogs are unaffected but just not to make this ‘Tall Wall’ idea too op there should be a cap of how many you can upgrade (100-200) just to make the game a little bit more interesting ( plus if this does happen, don’t make the look of the wall too much higher as it could block small things like traps behind them). Thanks! I wrote this just to say that this game is amazing! Although you have to pay for gems it is great! I want to create a game when I am older, and you have inspired me slightly more to follow my dreams. Keep doing what you do, Supercell! Overall great app but would be better if you could message your friends on it so supercell do your magic and make this happen plz. Clash of Clans (despite being a game of patience and pty) is very creative and enjoyable to play. I love this game and I have been playing it for many years. However, something that I find so annoying is defending clan castle troops. 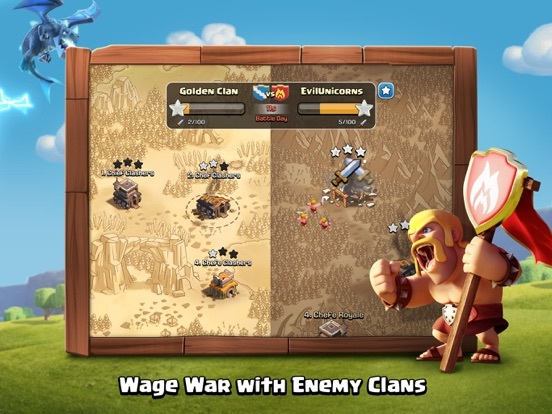 They have ruined so many attacks and ultimately, a lot of the time I think, oh, this base gets me ... trophies and isn’t too difficult, so then I attack it, then to get hit with the fact they have some crazy clan castle troops that mean I lose the attack and a load of trophies. In clan wars, I don’t mind them as that is the whole point. But in the normal game I just don’t feel like they should be there. There is nothing wrong with this game (so far). The only thing I REALLY want is -it sounds weird but- I want to be able to donate MATERIALS I know materials. But it would be amazing. Keep up the good work I’ve played all you game by the way AND I REALLY ENJOY THEM GOOD WORK SUPERCELL. Long searches for top players ruins the game! Becoming a top player in this game is my goal. This is done by reaching the legend league. 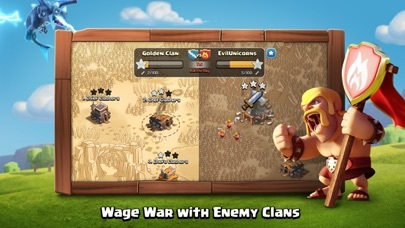 Once achieved the game is ruined by very long searches for opponents to attack. Who the hell has from 15mins up to an hour spare to sit around looking for a target to attack? I have a life so not me. Supercell this has been a terrible problem for a long time. And I don’t see signs of improvement. Ruins what is otherwise a great game. Good game best support staff I have ever talked very helpful and got my account back. I love this game! Amazing! i have played this for many years but the last few months they have showed there true colours.every update that seems to come never really improve the game just gets worse.i too feel there just there for the money when you question things in help and support they just cut you off.one of the best mobile games i have played gone to the worst in months just though greed.as for apple hold your head in shame quick enough to take your money not so to give it back. I’m a town hall twelve player and I have not spent any money to get there. It just took so long for buildings and hero’s to upgrade, so a suggestion is that you can have multiple builders upgrading one thing to reduce the time needed to upgrade it. This can speed the game right up and players would not have builders which are doing nothing. Also would you consider increasing the number of builders present again to speed the game up? Thankyou!! Nonetheless one of my favourite games of all time. Been playing it for couple years now and the fun has never stopped. Should be a button to restart village but amazing game in general. The reason why I want to restart is because my village is rushed. Yeah it’s pretty good nothing really to complain about progression system is good👌 gems are easy to get so it’s not to pay to win. Amazing app, played it for a couple of years now, great new “suggested upgrades” feature thanks! Great game to get all the family playing together, young and not nearly so young..but playing as one. The game is pretty awesome it’s not like you got to spend all time online but rather you can just spend free time and mostly enjoy it. I personally love this game. Thank for the opportunity to play. This game is amazing, I only have one problem with it (better than most other games). In the new update (inc. season challenges) you have added hero skins and changed the heroes and the way they walk etc. Apart from this problem that definitely needs changing this game is faultless. Thank you for producing such an amazing game! Great game - play it all the time, constantly refreshed so never gets boring. Latest update has taken all the fun out of the game. All geared up for money now. Awful graphics too, so no motivation to login and play. 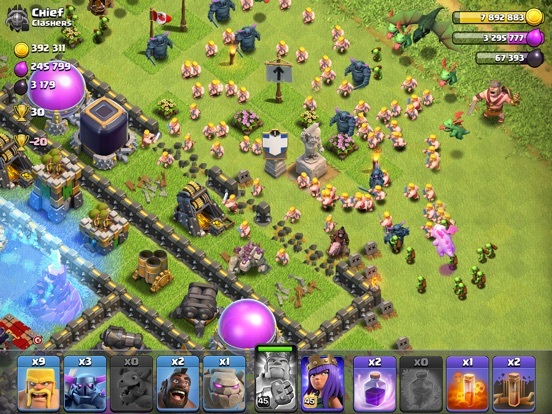 Looking for new game now to provide that treat - Clash of Clans has sadly lost that for me. Bye & thanks for all the cheese. This game has everything you want. It’s got good raiding mechanics as well as an amazing layout and tutorial on how to do everything. I love the new update but with the better animations with barb king and archer queen you mostly messed it up.when yoy press on them they don’t open their mouths.the sack of arrows archer queen has glitches(or somthing you messed up)through her hood.plz fix supercell cause my brothers hate it so fix it! CoC is increasingly being ruined by Supercell’s greed. I have no objection to developers making money from games - far from it - but every new feature in CoC is designed not to improve gameplay, but to extract more cash. The basic game AI has deteriorated to the point that troops are unconscionably stupid. The matching of players, particularly in the builder battles, appears to be so one-sided and uneven that it looks like it was designed entirely to make players gem up. The new battle pass is specifically designed to try to convince players to shell out £60 a year. All in all, CoC has gone from being a game with the option of a little bit of spending to being nothing but a cash grabber. Which is very sad. Just gone onto my iPad to start playing again and my whole village has disappeared? Extremely annoyed because of how far my village was. Where has it gone?! I absolutely love this game and I’ve played it for years alongside my friends but there are a few things that really do annoy me. For example when attacking an enemy I will try and deploy my troops so they will target something first, for example with a balloon I would make them target an air defence first yet they don’t always go to what you want and they will take out cannons first so you end up losing the battle which I find annoying. I understand that’s part of the game but it would be so much better if you added something like what you did in boom beach with the flares to make them go elsewhere first. (It could possibly be a spell and take up a slot) then another thing is how long things take to upgrade. This isn’t a major problem but it would be so much better if you could decrease the times somehow as it really is a slow, boring process but not only that it then makes you lose lots of defences (when the enemy attacks you) as for example your archer towers are being upgraded so I then lose trophies quicker than I can gain them unless I’m on 24/7. This game is a very good game, in this game you build, fight, defend, team up and fight other Clans! I have been playing clash of clans for about 4 Years including my old accounts and this account. I would recommend this to anyone who likes to battle, and build. This game is good but there is something I think would be good if added Clash of clans has said this before that it will not be added but here’s my idea of it. To be able to donate elixir, gold and dark elixir this here should be a event that happens every month. Depending on what town-hall you are say for example your town-hall 10 and you got a town-hall 5 in your clan you can only donate a quarter or even less amount this will cut down people abusing this system by literally having to do nothing this event could be called Clan loot donation where you donate to your clan mates every month FOR A limited of amount of loot so none can over board it. I think this would be a great idea to add. Even though clash of clans has said no to this before but if it is every month you can do it could be fairer. Game is great just customer help is poor. Was trying to get my Account back. I can’t log into the apple ID I used to first start the game as I have forgotten the password and I can’t change the password as the email linked to the apple ID has shut down in 2017 so I cant get emails on that address. Spoke to one of the customer support said he could help me get my account back provided I answered some questions. No problem here. Bearing in mind I started this account in 2012 and it’s now 2018 nearing 2019. So I can’t remember the details of the account precisely. Answered them to the best of my ability. Then the conversation closed and my account I had to use has been perm banned for phishing. Like what the hell. Not one word, not even another way to prove that I am the actual owner. I feel let down by the Customer Support team. The person I spoke to even said that answers I had given had matched some and others had not. Which is to be expected if you havent played the game in over 2 years and havent even got access to the apple ID used in the Game Centre linked to the account. I understand that security is a top priority but come on. The questions I got asked to answer cannot be answered from what resources I have, having not played the game for a substantial amount of time. The idea behind the game is definitely a good one but it’s almost as if the producers have lost their way. Everything is soooo expensive it takes an inordinate length of time to get anywhere which is why it’s so tempting to buy gems to get the job done. I understand it’s a business and money must and should be made but not for everything. The game is losing its intention. Please rationalise exactly what it is that the player is supposed to be achieving and how. Many of the weapon levels are just wrong when compared to the rest of the game items and army members. Also I’m trying to update to the latest but it keeps taking me back to the home page where it tells me there’s a new update available. Can we please just have an ‘Install’ button please. I’m still not updated. Also, as I have requested before, can we please have some way of seeing who it is that has donated troops rather than having to constantly say ‘Thanks to whoever donated’. We can’t all be constantly sat in front of Clash waiting to see who it was. We need to earn some money in order to pay for the game items !!!! I really liked this game at first. But now I've been playing it for a long time, I don't actually play it as such anymore. It takes so long to earn enough money, gems or elixir to build or do anything that I don't turn the game on for at least a week or sometimes longer. I then literally turn it on, take the money, elixir and gems and turn it back off. Then after a few weeks when I've got enough to actually build something, I start the build going and then turn off the game again. Why? cos it takes like 2 weeks to build anything now. That's not a game, that's boring and slow. The only reason I don't delete the game, is because I've taken a long time to build up my clan. But I think I'm getting to the point where I will delete this game now. Purely cos it's not an enjoyable game anymore. A game is something you want to play daily. Not something you can only play every couple of weeks for 5 mins. I love this game, I would come home and go straight to it, but like all games it can be improved by having a customisable character as the chief which would imitate yourself as if you are in the game playing your role, you should be able to unlock that at town hall 5 since you are partly half way through the town hall levels. You should also add in more, brilliant spells to help your attack during a battle, this should be unlocked at town hall 6. Plus, the amount of gems you have to use to get a builders’ hut is quite a stupid amount of I have to say so myself. This is the same with the amount of type to get something upgraded too. Also you should be able to change your name at level 3 not 5 but keep the idea of only being aloud to change your name once. Thank you for this brilliant game I love it and I bet all other players in the game too. Still awful not being able to 'gem' barracks 1 by 1, same for spell factory, Bad Greedy move! Worse is the league system!!! At th 9, I continuously have to fight myself back up to champion 3, because th10's & 11's that reckon they are only Master 3's, 2's and 1's, crystals 😧and even worse (gold, etc) continuously float over my very expensive 'useless' walls, decimating me and taking 20 + trophies every time! All I am offered, when looking for a battle is th 10's & 11's. Leagues need to be sorted!, Th 11's should not be able to attack th9's at all or lower, which does happen! This losing trophies at their levels Needs to be sorted! Make it fun for everyone, not pay all this gold for walls and guess what we will make it futile by letting a floater, float all over them because your only a th 8/9! Trying to get a revenge attack is mindless, if you ever can, there's no point because there are no trophies on offer because they're playing the league system and are so low down the supposed ladder that we have to feel sorry for them because even though they have a th 2-3 times higher than you they are 3-4 times lower in a league than you are, haha! 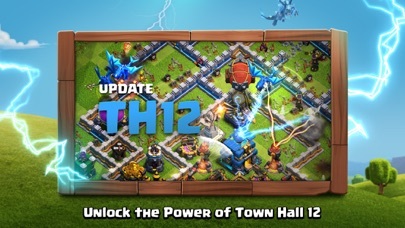 Yes I understand that SuperCell won’t do much work on anything before the 2nd highest townhall level but as a townhall 9 I can safely say there are a few. 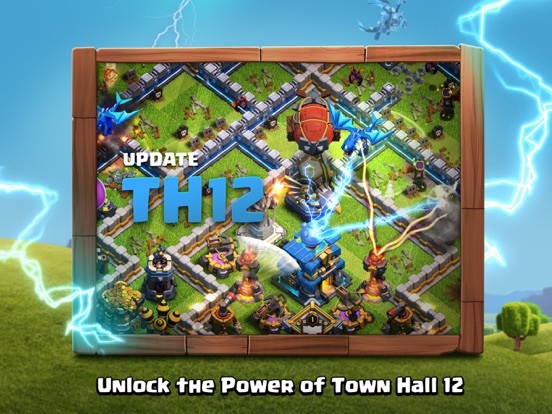 Firstly: why can you upgrade a wall TWICE at th9? To max out 1 wall at th9 (from being max at th8) costs 1.5million resources. Why not just charge 800K and leave it to 1 level being max. It doesn’t change much as th9 players will either use WallBreakers and rage them, jump spells or air troops. I’ve never attacked a base without 1 of these methods so it’s pointless giving walls an extra 500 health for that price. On another note: the cost for upgrading Hero’s is too much as there are so many levels as I’ve finished all upgrades and almost walls (yes 2nd level upgrade as well) and yet I’ve only got level 15 heros. Love the upgrades you bring out regularly like the electro drake and now the Ice golem but maybe you should add a couple things here and there to smaller TH’s even if it’s limited potions for those TH levels. 1 other thing. Ignore everyone on the subject of Gems. I’ve never spent a penny on this game and never not had gems. You don’t need to spam upgrades over and over and instantly upgrade them. I have 5 builders, buy the training potion and occasionally gem troops to clan mates. The trees and bushes give more than enough and so do the achievements and Clan games. Keep up the great work, look forward to 2019! Amazing game!changes are over due though. Walls are far too over priced, buildings take far to long to upgrade and/or build (I am th7 and it takes 8 days to upgrade to lvl8)!!! !As well as that when someone has joined a clan they should have a time limit before they can leave or join another clan (but should be able to be kicked out) as some just join a clan then leave after 1 min. Can the cost of builders stay 500 because that is challenging enough to get let alone 1000 or more!!!!!!!!!! !The troops and spells cost a lot! If building cost a lot fine but not troops and spell (including researching troops)!Despite that this game is very amusing and fun to play! The builder base is an amazing addition to the game and is very fun (however is easy to forget about). 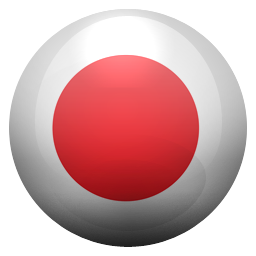 A cool addition to the game could be private chat? I know I have had a plethora of criticism however if that is fixed this game might very well be the best game ever!!!!!!!!!!!!!!!!!!!!!!!!!!!!!! Dear money grabbing thieves, I am beginning to hate this game. Everything takes like 2 weeks to complete, there is a lack of “are you sure you want to do this” pop ups, and it is very expensive. I have wasted 3 years of my life with this game, and nothing but a virtual village to show for it. I would give zero stars, but I have to give one for this review. The money grabbing cheats known as supercell need to either get rid of this game completely, or optimise it. In the builder base I was about to break 2500 cups, and then for some reason, I went on a huge losing streak and back down to 2100 cups, and as a bh6, I kept getting bh7 + 8’s when doing versus battles, and I was essentially forced to rush to bh7. It’s a huge shame that this game has gone to this state. Construction times need to be optimised. Given the audience that supercell is targeting, I don’t think 7-13 year olds are prepared to wait weeks for one upgrade, or be like the 20-40 year old coc youtubers that get tons of gems from sponsors. This game is in a crap state at the moment, needs to be fixed, and rounded out for ALL players, and not favour the top players. This WAS a great game! Unfortunately after a little over 3 years of playing, the recent updates have killed the game enough to make me consider stopping playing. Apart from the gem perks, builder base is POINTLESS! The Vs battles are so inconsistent, you either have a good run of wins, or get hammered by archer snipers who waste every second of your boost! 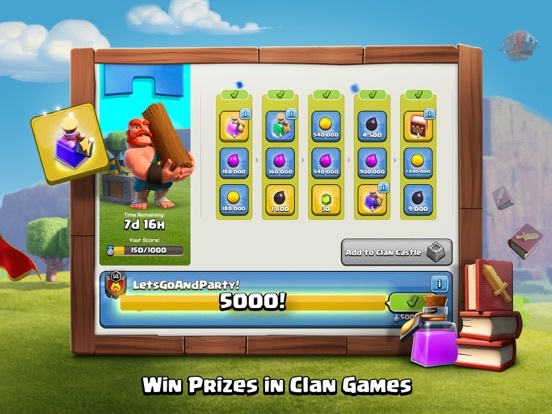 The Clan Games were a nice little distraction at 1st, but they have now become just a repetitive grind, with the same challenges over and over! Which is bad enough in itself, however if you’ve been fortunate enough to progress to the higher leagues, they’re made even worse by clouds! Oh I do hope you like clouds! Raiding has become almost impossible for casual players. You’ll easily spend 3-4 minutes watching a magnifying glass circle clouds until a village you have no chance of winning against eventually appears, press next, go boil the kettle and by the time you get back, you might be presented with another impossible village! While I have been playing this for many years now, I don’t really see any positive improvements. Time and again it is apparent that people are still using Bots to attack and defend their village.. this needs addressing by supercell !! I see a lot of the time my troops will blatantly walk around or even away from the town hall when they should be heading straight to it, or even in some cases they will right on top of it then decide it’s not good and walk away ... really ?? Now we have this quite ridiculous builder base game which serves zero purpose other than to frustrate further... unbalanced, weaker bases and troop levels trancing over what clearly is a stronger base ... and again troops avoiding the hall or walking away from it after starting to take it down ... the list goes on ... it is set up to make you fail ... I lost a total of 232 trophies on a streak of 10 losses once I have finally broken the 2700 mark ... not been anywhere near that since ... Come on supercell sort it out you money grabbing cheats ... stop swindling the general public and work a bit harder to make it fairer. Let us get our old removed Christmas trees back for a price of gems. ( I wrote a whole essay but my WiFi cut out so I’ve given up and just written the ‘what I want part’) Can be done with a log showing all our removed seasonal 1 time Christmas and Halloween trees as well as maybe an option to convert a tree into the old one. (You can tell I want my 2013 tree back but it still to be ‘Valuable’) it says 5 stars but it would be a 9/10 because of the infernoes but I won’t care about that if you implement my 2013 tree back! I’m begging, I’ve played since 2013 and that tree is something to prove it rather than just my word to people. Clan if you see this -Don’t mention ANYTHING if they actually do this- I just want that sweet gratification that supercell listened and they really do care about their customers especially this clash of clans team. Get this Game!!! Best game ever. I love this game and have a clan named ♡DESTROYERS♡ (join if you can)! Everything is perfect except one MAJOUR THING! The building time takes... FOREVER! I mean, I have a lot of full storages and the upgrade time is SOO slow! If you could, supercell, it would make the game a lot better if you could make the upgrade time and the build time faster, because I have deleted this game 2 times already because of this, every time getting far. I have got the app AGAIN now but it gets boring after a while of just upgrading because my storages are full and can not collect my elixir, dark elixir, or gold. This could easily be fixed! Just reduce every upgrade and build time by 5% for everyone who is past TH3 (some things are around 10 seconds to build) because it is to time consuming and I dint wanna delete the app again just because the upgrade and build time takes to long! I’ve played this game for a couple of years now I’ve really enjoyed it and all the new features and troops they have added, however I do believe if they added in something to help players with a rushed base that would dramatically bring players back to the game. Don’t get me wrong I’m not implying the game is dead however I know many people who still love the game but can’t enjoy it because they rushed their base when they were younger. Maybe they could add in some form of compensation or a tab near the change name option to go down a town hall, this sounds ridiculous however it would help a lot of players recover their bases, a couple of wrong upgrades lead to years of recovery or in some cases the base isn’t recoverable. All that aside I do really enjoy the game and it is by far the best app on the mobile gaming market place. Hi I think clash of clans Is the most awesome game but I think there is a few things that could be better like private chat so u could go on social click one or yr friends and along with all the other stuff a button comes up saying chat or message or something cause maybe you want to talk to someone individually without leaving/joining another clan or war strategies with just one person or little tips in war different one for everyone so that would be extremely useful also notifications when someone is on and talking in the clan so people are talking and sending messages In clan chat notifications come up so you can be like oh someone's finally on lets go talk or anything other wise a Good game but 5 stars only if these things happen other wise I might stop because it's annoying always having to leave The clan to talk separately otherwise thanks for a great game PLEASE DO THESE THINGS PLEASE PLEASE PLEASE!!!!!!! I personally like the game a lot and have spent hours playing, but there are a few things that I find a bit annoying. First of all, even if the developers are trying to make the game encourage the players not to rush, it makes it hard not to, because other rushed players, or players obviously beyond your level keep attacking you. Also, the time it takes to get a building leveled up is so ridiculously long, and needs improving. A lot of my friends who used to play, and I’m sure tons more of people in the world have stopped playing the game for that reason. It’s probably a way that all game producing companies make money out of it by tempting the players to buy items, but honestly I’ve never seen anyone buy items from those type of games. Personally I think the game would be made more fun if these points were improved. I hope you take this comment into account. As a relatively new player I found that getting into the game was fine but once you had passed a certain point the game got horribly unbalanced. 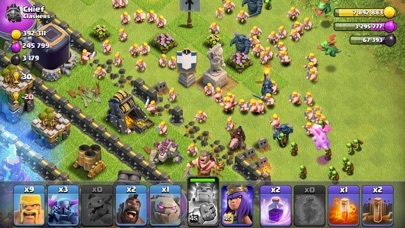 It’s hard to sit there and see where your base or play style needs improvement because the person that raided you had troops from their clan that you could never defend against or vice versa when attacking. The wait times are stupidly long and lack of any real “effort pays off” message is disheartening. Supercell are a money hungry company who made their money off of this game and are trying to milk it for what it’s worth before shrinking into irrelevance. Honestly if the game didn’t allow high level troops to be given via clan castles I could say that all you need is self control but that fact there means people can achieve with their wallets and trying to start out just to be beat down before you have a chance to really get started is a bad way to style the game. I have stopped playing this game every day like I used to a few weeks ago. This is because I think the game isn’t what it used to be, I’m a Town Hall 11 that’s a bit rushed that I’ve upgraded over time and built up my defences to a point were it costs like 5 million gold for 1 upgrade. It’s getting harder to find good loot on bases and a good air army that I use costs like 380,000 elixir so I need to find a good base with 300,000 and a loot bonus to get it back so there’s no point and I’m gaining nothing in elixir for the next army. People take 500,000 gold from me each time and my max wall level is level 9 because I don’t want to spend 3,000,000 on 1 wall. In the builders base I’m builders hall 8 that I’ve been upgrading but it’s annoying and stupid that you can only get loot 3 times every 8 hours and there’s only 1 master builder so an upgrade takes 4 days so I can’t upgrade anything in that time. That’s why I’m not paying it anymore and it seems the only good way to play is buying gems and it’s a free game. This is my favourite Phone game but I only ask of a few things. This game is amazing! I have been playing for a long time. It before the updates I was getting bored but then the update came and I started again. New things is always good and I’m happy with what they are. My main problem is that my WiFi connection isn’t stable and I understand that’s not Supercells fault, but all I would ask is, if someone loses connection during an attack please make it so that it cancels the attack. It is so annoying when I’m during an attack and I even get 3 stars with the losing connection sign and then after being kicked off only to find I have lost with half my troops wasted. Obviously upgrade times are too long but I can live with that! :) overall great game! Would recommend 100%. Hi I have been playing clash of clans (COC) for nearly 5 years not so much now, but now updates are better with magic items this has speeded up the game considerably. I feel aggrieved that wall pieces have come down in price when we have paid more than someone who is a couple of years into the game. (Refund please) 🤔. Also I would like to point out that I still can not update on my iPhone 7 yet!!! But have done on my iPad 2. What’s up turned phone off but can’t update. Game just goes back to home page and asks me to open then goes back to the congratulations there is a new update! Vicious circle. When I did manage to get home and update my iPad I was raided big style. Not to worry I’ll get it back! !👊🏻 Just please sort the update out on iPhone 7!!!! I think clash of clans is a good game but it so dull, that there is nothing special about this game, yes you can get two villages, when I played the other village island( I forgot the name because I don’t play it now) It was good at first but then I find all troops over powering that I would always lose in defence but win 1 star I attacking by using invisible archers also the village is so small, I find it completely pointless. 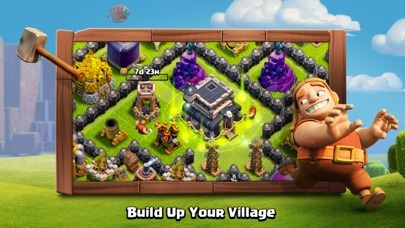 Another thing is both villages troops- it is supercell that makes them bad to overpowering that they can’t make it balanced for every, it completely spoils the fun a lot and finally there is not much use playing the game that it takes longer when reaching high townhall When training troops or building something. I see less people playing this game because they are bored and less people are attacking my village while I have an awesome defence and not able to get any trophies or get revenge on them which is suppose to be fun I just feel like I’m the only one playing this game. Good game, change and add these.. I like the game very much is very addictive but what annoys the most is that every time I find a base I actually have a chance of defeating, it so happens to have over powered troops in it clan castle. I don’t mind the fact that you can have clan troops in your castle but I wish that they could only be a certain level or specific group. For example: Say a base has a level three barracks and they request troops, they should only be able to get troops that are accessible from a level three barracks. This is because all the time my army gets absolutely destroyed before they can even bring down a building! Please do something about this. Atleast make it so the attacker doesn’t loose trophies if they loose from a battle with overpowered troops defending the base. Anyways this game is great when there are bases without clan troops in the castle. I will rate this two stars for the great gameplay but three stars taken away from that mishap. Ive played this game for a couple of years and with my experience i have realised that there is no true way a player is rewarded with the grind they have put in. If i spent a week grinding for an upgrade for a defence i should receive some sort of reward instead of waiting 1-2 weeks for the defence to upgrade and then start again. Rewards can be as simple as receiving a training potion boost for farming 1-2 million gold in a day. Just something to keep the player motivated and farm more. This game has alot of potential to expand its player base in the future especially if they make it easier to progress early-mid game instead of playing for 2-3 years and being a mid th10. Only because of this reason i would give this game 4 stars as the other aspects of the game are amazing. This game is amazing because you get two different worlds which is builder base and original base I like the original base better because it is harder to max out you get better troops and bigger and better town halls one thing I would like to add though is to make it so you can search up players name I now you can do that but it doesn’t work because when you type up someone’s name it says this name does not match please try again which annoys me a bit because I just won’t to type up someone’s name and it doesn’t work another I want is another town hall and different troops and new defences and maybe a new hero which would be amazing hopefully you read this and do the updates PLEASE DO THE UPDATES!!!!!! This was a good game but now it’s rubbish you constantly get raided by people way higher than your self I’m a townhall 10 and I’m constantly raided by near max lv12 townhall. I can never find a townhall lower than a 10 so how do they get to raid someone 2 town halls below thenselfs. you should only be able to raid the same town hall as yourself and shouldn’t be allowed to rank down either should be locked so you will never get some one 2 or more levels higher raiding you. Should be made so you cant quickly lose matches to rank down to get easy targets you should never be allowed to leave the league you are in. you can go to never lower than rank 3 of the league you are in. Once your there that’s it no going back. I’ve seen a titan 1 raiding a champion 3 how the hell does that happen??? Sort it out supercell or it will be dead. One of the worse games I have ever played. Firstly, the time it takes to upgrade buildings is unreasonable. At this point, I may as well leave the game and come back when I am in my 90s. This means that the game is very boring and repetitive. CoC is terrible because of time wasting and boredom. Next, it is frustrating as hell. How would you feel if you worked hard for hours only to find that some person has stolen your loot? 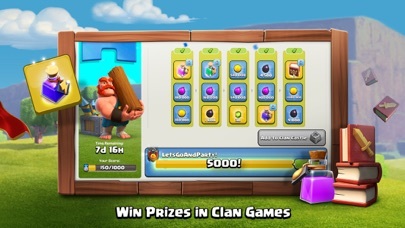 In addition, CoC is extremely difficult, especially for a touchscreen game. THIS GAME IS NOT FOR THE CASUAL PLAYER. In addition, CoC encourages stealing. Coc is awful as it will drive you off a cliff, I almost want to do so every time I play this game, luckily I no longer play(for those who do not get it, this part is figurative language, metaphorical). In conclusion, I would recommend this game to a professional player, they only stand a chance to play this game. Play at your own risk, I have warned you now. Thank you. I love this game and am an avid user (th11 player); however, there are fundamental issues. The wallbreakers are to random. They focus on the nearest wall even though it is a pointless, waste of time target. I’m bored of wallbreakers running off the wrong way and blowing up a random wall away from my target. What can’t you simply choose an area of wall as your target before you release them? Then they aim for that focus. Much more relevant to the strategy game this is. 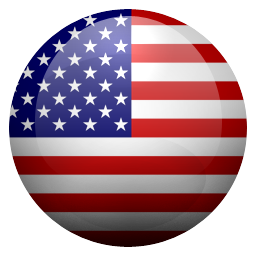 Being able to identify target areas of bases creates a whole new level of strategy and gamesmanship to the game. This will increase tactics and take this game to the next level. Please developers read this and develop the tactical side of the game, as at the minute the randomness let’s it down. Please. 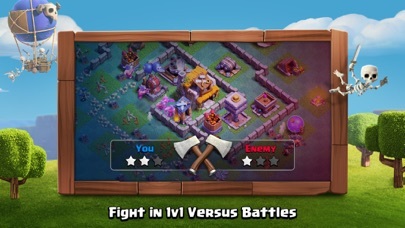 Hi I have contacted you several times recently concerning issues I have with your second village (NOT THE MAIN VILLAGE ) I have noticed that your battle match up algorithm isn't performing in a fair manner which is leading to game players being beaten by much weaker opponents who do not have either the upgraded troops or defences that you have !!! I am well aware that this has nothing to do with "tactics" on behalf of the player & everything to do with the algorithm you employ to determine the outcome of each battle. I would like this algorithm to be updated to give the players a fairer more enjoyable experience myself included but for some reason I am being completely ignored ????? I am of course logging all of this & would like an appropriate response to be sent to me from someone within your company who can ensure that this matter is taken seriously and the algorithm updates are made. This app is great, I've been playing it for years but there's a couple things that need to be changed. Firstly upgrades take far too long. As a th9 i have wait 6 or even 10 days for upgrades to finish which is ridiculous. Also the price of walls is becoming out of hand. I'm only th9 and yet I have to pay 2 million for lvl 10 walls, and I have 250 of them. Also I see why you don't want people changing their names all the time but at least bring it up to 3 changes. I say, I've been playing for a few years now and I changed it a while back when I was bit younger and now I'd like to change it again but I can't which is simply just frustrating. 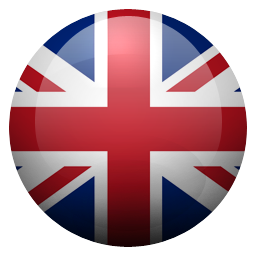 Great app I'd highly recommend but a couple changes are due. I’ve been a player for a very long time, I love how simple the game is to understand and how it gradually adds in more features as you progress through the game. I do have one small request though. I have read a few other reviews and I would have to agree that it can take a very long time to make progress in the builder base and I think that you should be able to unlock the master builders son/daughter as a builder as well. I know it kind of defeats the point of the builder base but they could even build slightly slower than the master builder to avoid this. Overall I think this is a great game and I have enjoyed playing it. The game in it self is an amazing game but the upgrade time is way too long because 1 day wasn’t enough it has to go on for 3 days etc and most people who buy gems spend a lot of money on gems because you can spend them so fast because of the upgrade time and for the people who don’t buy gems they’re taking down all the obstructions to get gems and you don’t even get that many gems from the obstructions and gem box spawns are to low. Moral of the story you have to wait for ages to get things to upgrade so could you please fix that or make it easier to get gems to boost building speed. Thanks in advance.